↑ "जियो का नया प्लान सिर्फ 8 दिनों के लिए". अभिगमन तिथि 15 अगस्त 2017. ↑ "T20 World Cup 2016: Free unlimited Wi-Fi at 6 stadiums, courtesy Reliance Jio". ↑ Bhupta, Malini. "Reliance Jio test drive: service open to select customers through invite only". अभिगमन तिथि 2016-05-25. ↑ "Mobile android app store: Jio 4G Jio play app, jio tv app, jio tv channels app". digitalappstore.blogspot.in. अभिगमन तिथि 2016-05-20. ↑ "Reliance to launch Jio On Demand with over 450 TV channels". Indian Television Dot Com. अभिगमन तिथि 2016-05-20. 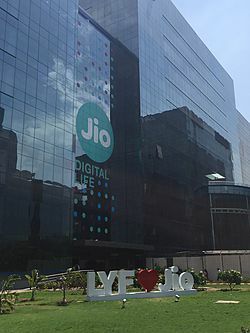 ↑ "Reliance Jio to Launch Jio Play, Jio Beats, Jio Mags, Jio News and Jio Money - TeleAnalysis". TeleAnalysis (अंग्रेज़ी में). अभिगमन तिथि 2016-05-23. ↑ "Jio Join app: First look and comprehensive feature review". Telecom Talk (अंग्रेज़ी में). 2016-03-16. अभिगमन तिथि 2016-05-20. ↑ "Exclusive First look at Reliance Jio Mags: Jio's answer to Google's Play Newsstand". Telecom Talk (अंग्रेज़ी में). 2014-12-08. अभिगमन तिथि 2016-05-20. ↑ "Reliance Jio Offers 4G Connections Through Referral Scheme - CXOtoday.com". www.cxotoday.com. अभिगमन तिथि 2016-05-23. ↑ "Exclusive First look at Jio Drive : India's answer to Google drive and One drive, to offer 100 GB storage". Telecom Talk (अंग्रेज़ी में). 2014-12-05. अभिगमन तिथि 2016-05-20. Tharun G (19 April 2015) Pan India 2015 spectrum holding data sheet (updated), Mumbai, India: Telecomtalk. (Report). Retrieved 30 November 2015. "Jio owns 800 MHz and 2300 MHz spectrum in 16 and 22 circles of the country, respectively"